Update: Annual Conference 2014 opened today, June 11, to a nearly packed Exhibit Hall at The Lakeland Center. Check-in and Ministry Expo opened in Jenkins Arena. The Prayer Garden is open today and will open at 7:30 a.m. Thursday and Friday. Check Florida Conference Connection daily for coverage of Annual Conference 2014. 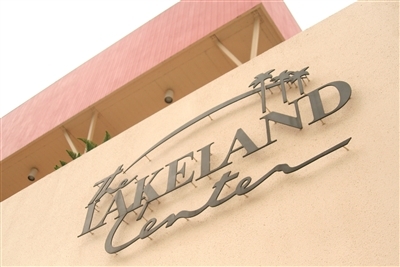 LAKELAND – Beginning Sunday, United Methodists will take over The Lakeland Center, transforming it into a hub of activity related to “The Mission of God” for about a week. Florida Conference staff and volunteers will be busy installing pipe and drape, setting up booths and exhibits and getting ready to welcome about 2,000 voting members and guests from across the state when Annual Conference starts Wednesday, June 11. The Annual Conference Prayer Garden will open at 7:30 a.m. Wednesday through Friday, June 11-13, in Lake Hollingsworth Room B at The Lakeland Center. File photo by Dave Walter. For the first time in recent years, the conference will stretch out over four days instead of three. Starting a day earlier offers time for enrichment sessions – previously called preconference workshops – to be incorporated into the Annual Conference schedule. In addition to worship, reports, celebrations and issues up for a vote by clergy and lay delegates, this year’s event will offer generous breaks for lunch and dinner. “We hope that will encourage the fellowship aspect that is an important ingredient of Annual Conference,” said Rev. David Dodge, assistant to Florida Bishop Ken Carter. Attendees also will have time to visit the Prayer Garden and Ministry Expo, both opening early and remaining open most of the day Wednesday through Friday. Also different this year: Most plenary sessions will be staged in the venue’s Exhibit Hall, a less cavernous space than Jenkins Arena. Check-in stations and a variety of Ministry Expo vendors and exhibitors will be set up in the arena, which should be the first stop this year for Annual Conference attendees arriving at The Lakeland Center. Badges should be picked up at the check-in station, which will be just inside the arena at the entrance closest to Guest Services. A family-friendly space will be set up in the facility’s Lake Hunter Room for attendees who bring children to the conference. Parents should provide snacks and beverages and be prepared to supervise their children. A webcast of the Annual Conference proceedings will be available in the Lake Hunter Room. The Twitter hashtag is #flac2014. To access apps for mobile Internet devices, click here. To access all things related to Annual Conference, click here. Among highlights will be a performance Thursday evening by the Africa University Choir, which kicks off a three-week concert tour of churches throughout the Florida Conference. Click here for the schedule. On Saturday, voting members will be asked to choose between a convention hotel near Downtown Disney in Orlando or a return to The Lakeland Center for the 2016 Annual Conference. The 2015 site will be Bethune-Cookman University in Daytona Beach, as approved at last year’s annual meeting. Volunteers are still needed for the event. To see a list of opportunities, click here.